Luxe Gourmets' premium sushi-grade seafood has been prized by Michelin-starred Japanese restaurants for the past thirty years. Now you can give foodies in your life the gift of luxury with a Luxe Gourmets Card. The best of the oceans delivered to their door overnight. Emailed to the Recipient. The recipient will receive the card almost instantly. Luxe Gourmets’ premium sushi-grade seafood has been prized by Michelin-starred Japanese restaurants for the past thirty years. 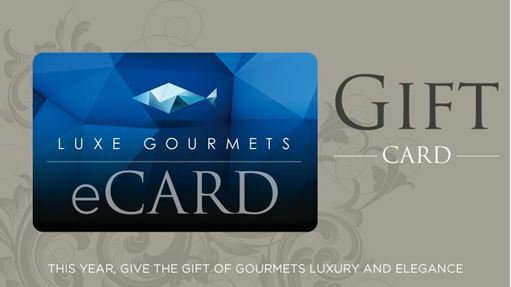 Now you can give foodies in your life the gift of luxury with a Luxe Gourmets eGift Card. The best of the oceans delivered to their door overnight. I understand that eGift Card may be used only to purchase products at Luxe Gourmets through www.luxegourmets.com or 1.800.620.8848. It may not be used to purchase gift cards and cannot be redeemed for cash. eGift Card may not be used by multiple parties. Once the eGift Card is activated by the receiver, it is non-transferable. For balance inquiry, please go to My Accounts on www.luxegourmets.com or call 1.800.620.8848. Not valid on International shipments. Mailed in a beautiful cardholder with handwritten memo inside an elegant envelope. Denominations of $50, $100, $250, $500, and $1000. 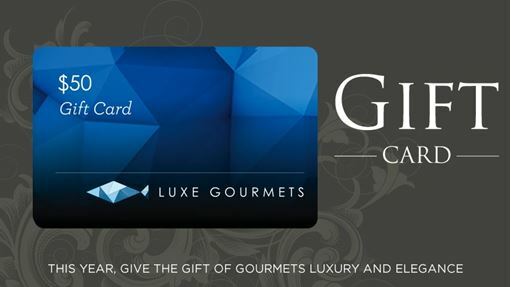 I understand that Gift Card may be used only to purchase products at Luxe Gourmets through www.luxegourmets.com or 1.800.620.8848. It may not be used to purchase gift cards and cannot be redeemed for cash. Gift Card may not be used by multiple parties. Once the Gift Card is activated by the receiver, it is non-transferable. For balance inquiry, please go to My Accounts on www.luxegourmets.com or call 1.800.620.8848. Not valid on International shipments.